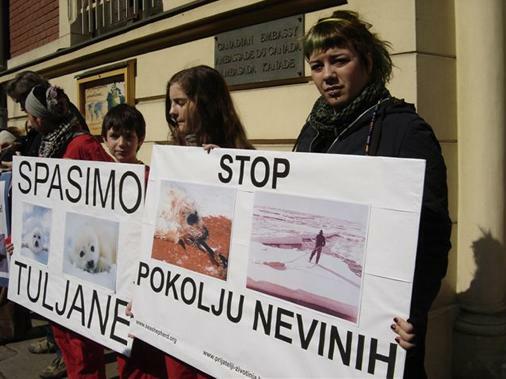 This year too Animal Friends draws attention to the horrible slaughter of 325,000 baby seals! The Canadian commercial seal hunt is the largest mass slaughter of marine mammals in the world. Canada intends to kill over 325,000 seals in March and April! 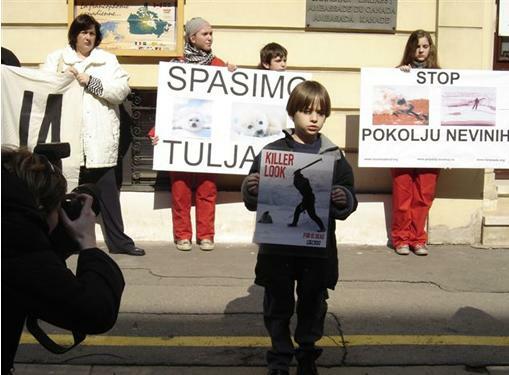 So as to raise voice against such a crime for the reasons of profit, on Tuesday, March 15, 2005 Animal Friends will join the Worldprotest by holding a demo in front of The Canadian Embassy in Zagreb, Prilaz Gjure Dezelica 4, starting at 12 noon. 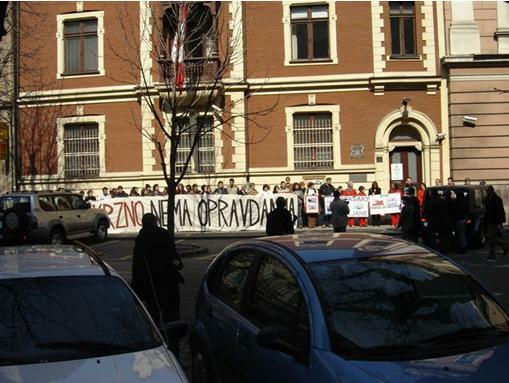 On that occassion, a protest letter will be also handed out to Canadian Ambassador, Ms. Stefanie Beck. Over a 3-year period (from 2003-2005), the Canadian Department of Fisheries and Oceans (DFO) announced a scary kill quota of 975,000 baby and adult harp seals and 30,000 adult hood seals. In 2004, 365,971 seals were slaughter, and 283,497 harp seals were killed during the 2003 season. In 2002, the sealers slaughtered over 312,000 although the kill quota was set at 275,000. There is no scientific justification for these quotas as the seal counting techniques used amount to little more than guesswork. Further, for every seal landed, another is shot and lost under the ice, not to be included in the count. According to the Canadian government, the hunt will not harm seal populations, however, the facts dispute their unfounded claim. When the first European explorers landed on the East coast of Canada, there were an estimated 30 million seals (harp seals made-up 80% of that number). Because of the reckless management of the hunt in the past, Canada allowed the number of harp seals to drop to 1.8 million in the early 1970s. Now they claim that a 'healthy' population of 5.2 million exists but in the same breath admit that they have not had a peer-reviewed population survey since 1999. Scientists and environmentalists, though, believe the hunt is a threat to the survival of the species. In the last four years alone, over a million harp seals have been killed in a most cruelest way - by smashing their heads with clubs or by rifle shots. The Canadian government looks for as many avenues as possible to profit from their annual, government-subsidized slaughter. Currently, Canada exports the following seal products: sealskins (furskins/pelts and leather), seal oil, and seal meat. Due to a revived fashion trend, the demand for seal pelts has sky-rocketed, especially in Europe. Harpseals.org reports that high fashion designers such as Prada and Dolce & Gabbana are selling sealskin apparel. Canada sold pelts to 11 countries in 2004 with Norway, Germany, Greenland, and China purchasing the largest quantities. Other buying countries were Finland, Denmark, France, Hong Kong, Greece, South Korea, and Russia. Why protest agianst the Canadian seal slaughter? The slaughter of seals is incredibly cruel (a post mortem survey has shown that 42% of these babies are skinned alive). It is a threat to the survival of the species. It is a threat to the survival of cod. It is a slaughter done mainly for unessential, vanity, and luxury items, and therefore, is unnecessary. It is a killing of animals in front of their mothers. It is a slaughter of newborn seal pups (about 95% of the seals to be slaughtered are babies less than four weeks old). For more information please visit www.seashepherd.org and www.harpseals.org where you can listen to the message of American actor Martin Sheen who also joined the protest speaking out against the seal hunt, see bloody photo galleries or sign petitions against the Canadian seal slaughter.